Test flown following maintenance 19-Dec-2018, and flew Cairns, QLD - Horn Island, QLD - Mount Hagen 20-Dec-2018. 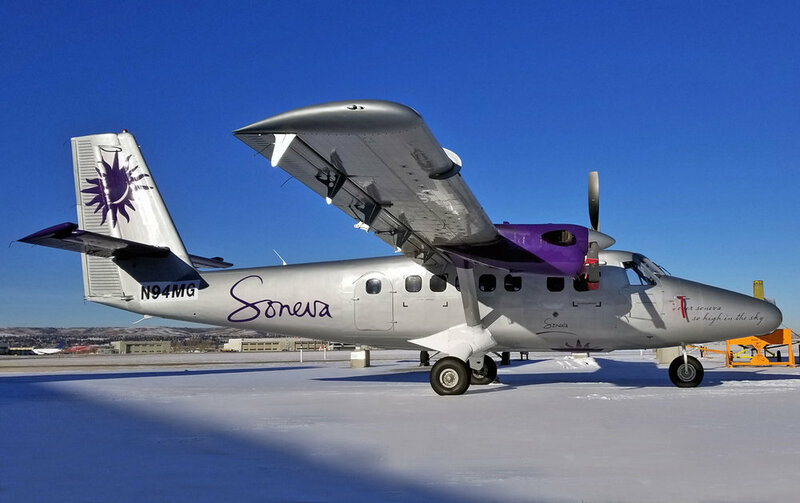 Flew Calgary-Int’l, AB - Great Falls, MT - Denver-Front Range, CO - Neosho, MO - Marianna, FL - St. Augustine, FL - Fort Lauderdale-Executive, FL - Providenciales - Curacao 16/22-Dec-2018 on delivery. ex C-FZDS. Flew Victoria-Int’l, BC - Bellingham, WA - Portland-Hillsboro, OR - Sacramento-Executive, CA - Murrieta, CA 10/11-Dec-2018 for completion work with Ikhana. Flew Spokane-Int’l, WA - Victoria-Int’l, BC 19-Dec-2018 after painting. With Winair’s return to the legacy paint scheme, the three latest Twin Otters have also received names, as seen below. Noted at Altenrhein recently for operation on behalf of the Four Seasons Resorts in the Maldives. Why was the Summit Air DHC-6-300 C-FTFX ferried to (or via) Panama City 30-Nov-2018? What is the MSN for the Solomon Airlines DHC-6-300 H4-MAX which was delivered 05-Dec-2018? Interestingly, I noticed that the Aeromaster aircraft in the first two images is actually the same machine as the Air Borealis one. Registration cancelled 13-Dec-2018 on export to Saint Maarten. The aircraft had been doing a series of air tests from Calgary in early December, after having been there for most of 2018. I’m guessing the delivery flight to Winair is either underway or expected shortly under the new PJ- ident. Flew Spokane-Int’l, WA - Redding, CA - Murrieta, CA 13-Dec-2018. This aircraft had originally from from the paintshop on 14-Mar-2016 in an all white c/s, then was painted for Aurora by Apr-2018. Registration cancelled 13-Dec-2018 to U.S.A. and reserved by Viking Air Ltd. [Bank of Utah Trustee] as N966VK. This is the 2nd aircraft for Qatar, joining N963VK which was registered 06-Dec-2018. Twin Otter World will be updated later today - however, possibly not before the 2:00pm cut off time for the subscription issue. The Service/Product directory has been removed temporarily to give me an opportunity to make some updates. Updates to Twin Otter Archive will commence later today as well. 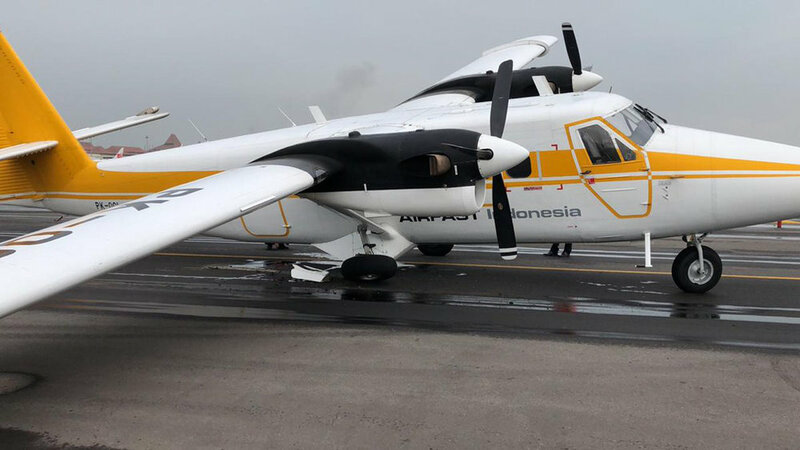 Airfast Indonesia has introduced a revised livery, as seen in the two pictures below of PK-OCF. Updating previous entry for 19-Nov-2018; flew Iqaluit, NU - Keflavík - Glasgow - Nis - Hurghada - Al Ain - Male 20/26-Nov-2018 on delivery. U.S. registration cancelled 26-Nov-2018 to the Maldives. Updating previous entry for 19-Nov-2018; flew Marshall, MO - Griffin-Spalding, GA 19-Nov-2018. Flew Bar River, ON - Oshawa, ON 25-Nov-2018; and then Oshawa, ON - Wilmington, NC - Nassau - Panama City 28/30-Nov-2018. Starboard main gear failed while on taxi for departure from Juanda, Indonesia on 28-Nov-2018. The aircraft is seen below. Test-flown from Fort Pierce, FL 04-Dec-2018 following maintenance with Aviation Management Repairs; flew Fort Pierce, FL - Fort Lauderdale-Int’l, FL - Montego Bay same day returning to its base in Cartagena, Colombia. Test-flown from Cairns, QLD 04-Dec-2018, and then flew Cairns, QLD - Gurney, PNG 05-Dec-2018 on delivery to Solomon Airlines. Following pre-delivery work, ferry tank installation and painting at Regent Aircraft Services, the aircraft departed Calgary on delivery. Flew Calgary-Int’l, AB - Iqaluit, NU - Keflavík - Wick - Altenrhein/Saint Gallen 24/27-Nov-2018 on delivery to Zimex/Star Aviation. On 30-Nov-2018 in continued on Altenrhein/Saint Gallen - Alghero - Hassi Messaoud. The aircraft is seen below following painting, carrying the end-user Algerian registration, and then below that on departure with the Canadian registration sticker applied once again. Registration cancelled 05-Dec-2018 and registered to Viking Air Ltd. [Bank of Utah Trustee] 06-Dec-2018 as N963VK. Flew Calgary-Int’l, AB - Spokane-Int’l, WA 26-Nov-2018 for painting. IKHANA Aircraft Services, a DBA of IKHANA Group Inc., provides DESIGN - BUILD - FLY solutions to the aerospace industry through integration of new technologies, aircraft modifications, heavy maintenance, major repair, and critical parts manufacturing. Headquartered at the French Valley Airport (F70) in Murrieta, California, IKHANA holds FAA, EASA, Transport Canada, and Fiji repair station approvals, FAA Parts Manufacturer Approval (PMA), and is a Viking Air Factory Endorsed Service Center. IKHANA has a proven reputationfor developing unique engineered solutions across a wide variety of aircraft platforms and diverse customer base including extensive experience in the DHC-6 Twin Otter, King Air, and Gulfstream airframes. Flew Victoria-Int’l, BC - Bellingham, WA - Redding, CA 20-Nov-2018. The aircraft is seen below at Victoria earlier this year. Grand Canyon Scenic Airlines Vistaliner N241SA (MSN 556) is seen below exiting the AIE hangar at Murrieta, CA yesterday. AIE is performing avionics upgrades to their entire fleet of Twin Otters and Grand Caravans. Following completion of work at Regent Aircraft Services in Calgary, N495NS flew Calgary-Intl, AB - Great Falls, MT - Rapid City, SD - Lincoln, NE - Marshall, MO 18/19-Nov-2018. Flew Murrieta, CA - Calgary-Int’l, AB 16-Nov-2018 in preparation for delivery flight to the Maldives. The non-stop flight from southern California was completed in 7 hrs and 30 mins by World Wide Ferry. The aircraft is seen below. Returned to U.S.A. following skydiving contract in Québec 12-Oct-2018 when it arrived at DeKalb, IL. Flew DeKalb, IL - Mena, AR - Brownsville, TX - Puebla (Mexico) 13/15-Nov-2018 for the winter. 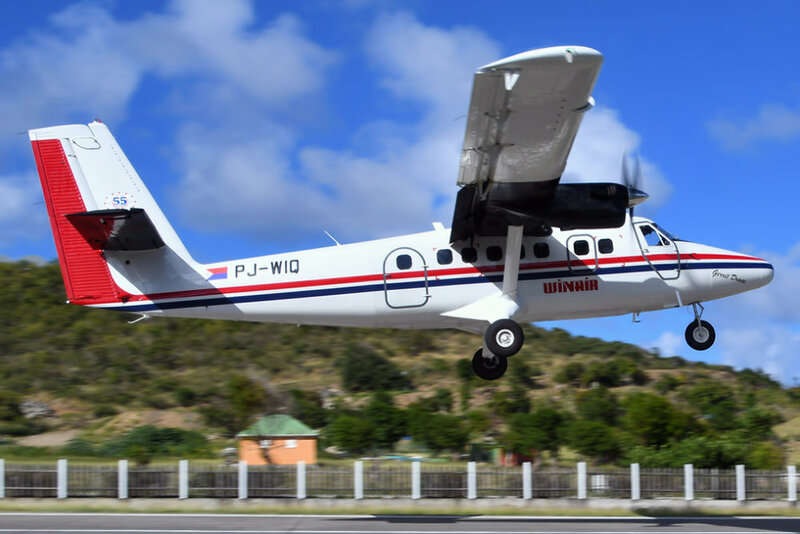 Updating entry for 08-Nov-2018; flew Great Falls, MT - Roundup, MT - Clinton, OK - Evergreen, AL - La Belle, FL - Providenciales - Sint Maarten 08/10-Nov-2018 on lease to Winair. Canadian registration cancelled 15-Nov-2018 to PJ-WIQ. Flew Calgary-Int’l, AB - Denver-Centennial, CO - McAllen-Miller, TX - Liberia 12/14-Nov-2018 en route to Antarctica. Transferred to Longview Aviation Asset Management Ltd., North Saanich, BC and registered 15-Nov-2018. The former J8-GAA (MSN 239) is seen at Calgary-Int’l, AB where it is undergoing maintenance and repaint at Regent Aircraft Services. The first production Series 400 (MSN 845) is seen below getting a wash. As can be seen in the picture, it also carries “Operated for NASJet” titles. Overhaul and refurbishing completed at Airdrie, and flew Airdrie, AB - Great Falls, MT 08-Nov-2018 on delivery to Winair. The aircraft can be seen in the photo below. Winair previously operated this aircraft from 2008 to 2012 as PJ-WIN. Noted at Victoria-Int’l, BC 07-Nov-2018 now in full Qatar Special Forces c/s, as seen in the photo below by Tim Martin. The aircraft had been originally come from the paint shop on 15-Mar-2018. 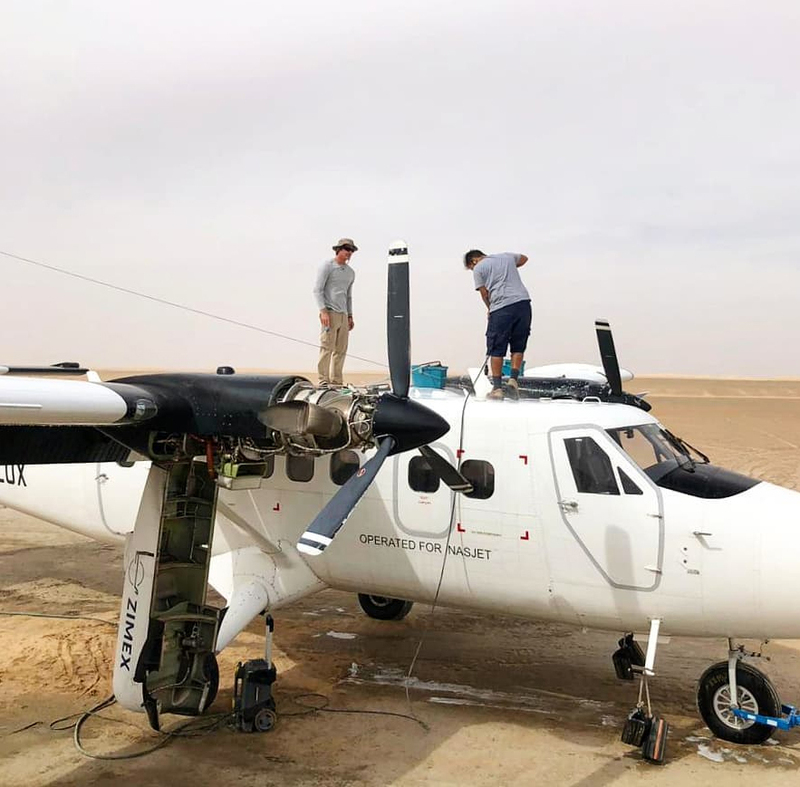 This is the second Twin Otter pending delivery to Qatar where they will be employed by the Special Forces branch supporting their Skydiving team. Flew Calgary-Int’l, AB - Spokane-Int’l, WA 07-Nov-2018 for painting. JACKSONVILLE, FL – Team JAS and the Chilean Air Force have executed another annual extension to the comprehensive Logistics Support Agreement originally signed by both parties in October of 2015. "We are very pleased that the Chilean Air Force continues to value the parts, services, equipment and logistics support that Team JAS has delivered to their Twin Otter fleet for the past 3 years” said Andy Sanfilippo, CEO of Team JAS. "We have provided all levels of support to the Chilean Air Force fleet at bases including Santiago, Puerto Montt and Punta Arenas. We have provided Parts, MRO Services and Aircraft Maintenance to support all missions, including their critical trips into the Antarctic and back”. 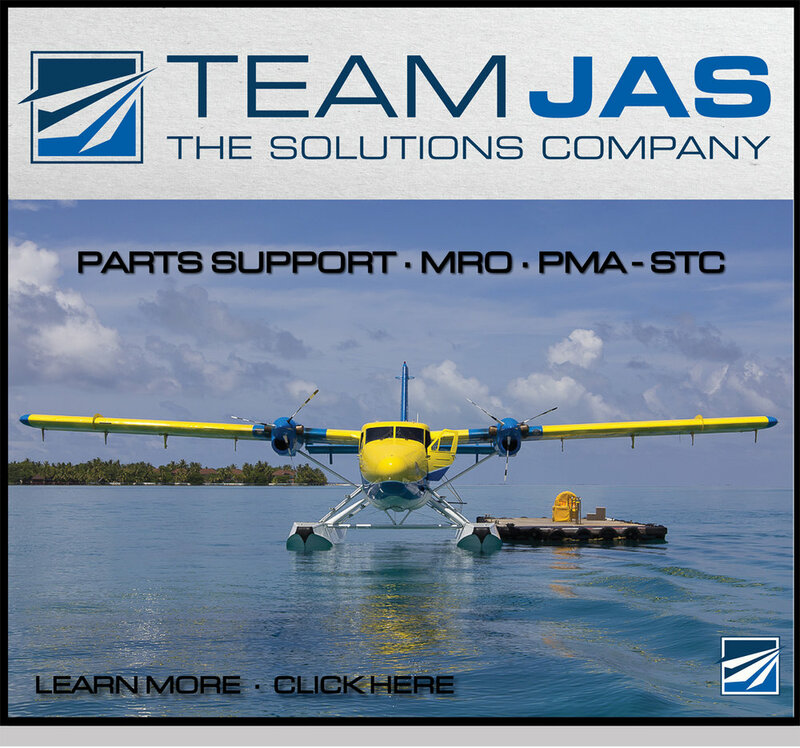 Team JAS, headquartered in Jacksonville, Florida has continued to grow to meet higher demand in the Americas as well globally. “We look forward to many more years supporting the Chilean Air Force’s fleet of Twin Otter Aircraft and in continuing to bring new solutions that translate into higher aircraft operational readiness” added Mr. Sanfilippo. Flew Calgary-Int’l, AB - Williston, ND - Sioux Falls, SD - Olathe, KS - Decatur, AL - Lake City, FL - Nassau - Providenciales - Saint Croix 01/04-Nov-2018 on lease to Seaborne Airlines once again. The aircraft had previously been leased to Seaborne from 2012 to 2015, and then to Winair during 2016 & 2017. Flew Mount Hagen - Horn Island, QLD - Cairns, QLD 28-Oct-2018, presumably for maintenance. Flew Calgary-Int’l, AB - Denver-Centennial, CO - McAllen-Miller, TX - Liberia - Guayaquil - Arica - Concepcion - Punta Arenas 30-Oct/04-Nov-2018. Updating entry for 24-Oct-2018; continued Paamiut - Keflavík - Shannon - Nantes - Gerona - Malta - Heraklion - Sharm el Sheikh - Amman 29-Oct/03-Nov-2018. Flew Calgary-Int’l, AB - Denver-Centennial, CO - McAllen-Miller, TX - Liberia - Guayaquil - Arica - Concepcion 01/05-Nov-2018 en route to Antarctica. Flew Calgary-Int’l, AB - Colorado Springs, CO - McAllen-Miller, TX - Liberia 03/04-Nov-2018 en route to Antarctica. Flew Victoria-Int’l, BC - Calgary-Int’l, AB 03-Nov-2018 for attention with Regent Aircraft prior to delivery. The Washington Group’s DHC-6-300 N167WC seems to have fled the Pacific Northwest for warmer climes, and is seen below at Murrieta, CA on 27-Oct-2018.